This is a high-end tablet that is competitively priced. It stylish, powerful and cheaper than the iPad Air. Wi-Fi and weight issues are drawbacks, but they don't mar the overall experience. The Kobo Arc 10HD is definitely value for money. 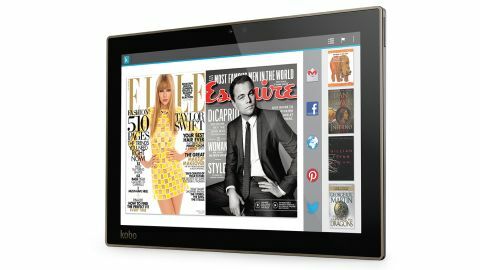 Kobo has launched an array of devices recently, including the Arc 7, the Arc 10, the Aura HD and now the Kobo Arc 10HD. Impressive. But what's more impressive is that the launch of all these devices hasn't affected the quality of the hardware. Just in time for Christmas and just after the iPad Air launch, the Arc 10HD is the final throw of Kobo's dice, the manufacturer's big finale. The jazz hands. It's what Kobo has been building towards for the last 10 months, with its rhetoric about "high-quality hardware for the sophisticated user" and its description of the Aura HD as "the Porsche of ereaders." The Arc 10HD is an excellent tablet, and it's competitively priced. The 2,560 x 1,600 screen is stunning, it comes with an HDMI-out port and it has some powerful specifications under the hood. And it's substantially cheaper than the iPad Air. Kobo has always focused on the reading experience, with apps like Beyond the Book and Reading Mode. But while it makes sense that those features appear here, delving into a long book isn't something that feels comfortable on a heavy 10-inch tablet. With that said, as a multimedia device, the Arc 10HD excels and is worthy of a title challenge for best-value tablet this Christmas. The Arc 10HD is minimalist in design with few external ports and barely protruding buttons. As with other Kobo products, it's aimed at an older, more sophisticated crowd. It's hard for a 10-inch tablet to look effortless and unobtrusive, but the Arc 10HD pulls it off. However, it does feel a bit delicate. The plastic back-casing is easily marked and without a protective case, you'll find yourself handling it gently to avoid scratches. This isn't a device you would trust your kids with. Despite its design simplicity, this is a powerful tablet. Under the hood the Arc 10HD houses an Nvidia Tegra 4 1.8GHz quad-core processor and 2GB of RAM - slightly more than the iPad Air, which only has 1GB RAM. The 2,560 x 1,600 resolution screen is the Arc 10HD's undisputed stand-out feature. It's crisp and mesmerizing. Even in direct sunlight and at sharp viewing angles, the screen performs well. Refreshingly, the Arc 10HD comes with a mini-HDMI out port - unusual for a higher-end tablet. If you've got a good LCD 1080p TV, the Arc 10HD's mirrored screen on TV looks excellent. There isn't much else in the way of physical connectivity other than the USB and headphone ports. The physical buttons sit on one corner of the tablet and, like the rest of the Kobo product line, the on button is a retractable slider, making it harder to switch on by accident. A new feature that Kobo has introduced is a miniscule, pinhole-sized, white light that indicates that the Arc 10HD is on, even when it's asleep. On-board storage is advertised as 16GB, but with bloatware you'll actually have about 12GB useable storage. There is no external storage port, which feels like a genuine shame given that the device costs £299. If you're prepared to spend that much money on a quality tablet, you want to have removable storage as an option. At 9.9mm thick and weighing 627g, the Arc 10HD is both heavy and thin. It ways 149g more than the iPad Air and when you pick up the Arc 10HD, it's instantly noticeable. Tablets this size are hard enough to hold as it is - the extra weight can easily take its toll on your wrists in a short amount of time. It doesn't feel comfortable or natural to use the Arc 10HD on anything other than a flat surface for an extended period of time. If you want to lie in bed and read a book or watch a film, it's unlikely you'll win a game of forearm endurance. The Arc 10HD has the basic sensors most modern tablets come with: gyroscope, accelerometer and ambient light. On the back of the Arc 10HD there are dual stereo speakers that don't sound too bad. They have no base, but there's also no distortion, and audio sounds refreshingly clear. You wouldn't use this as a loudspeaker option, but for a TV show or non-action film they'll perform just fine.